Pets: All animals with fur and feathers shed dander which is allergic to many people, In addition, flea collars, powders and shampoos contain toxic chemicals. Depending on where you live and your climate you may be exposed to other environmental triggers such as, pollen, mold, dust, household cleaning supplies, solvents, asbestos, pollution, automobile exhaust. 2. Personal Care Products – Did you know that the average woman uses 12 different personal care products (deodorant, hair spray, makeup, lipstick, lotions, cleansers, etc) every day. The average man uses about 6. Most conventional skincare products contain petrochemicals, parabens, synthetic fragrances, urea, etc. Read the labels of all those things you are putting on (and in) your body. The skin is very porous. If you can't pronounce many of the ingredients, they are probably not good for you. Find an organic, natural skin care line like Essona Organics (www.essona.com). Note: Hair colorings contain large amounts of toxins, so if you have skin problems on your scalp, neck and/or face, look to hair colorings as a probable culprit. 3. Diet – Whoever said' “You are what you eat” was right. You cannot expect to constantly eat nutritionally deficient food, laden with saturated fats, refined sugars, bleached flour, salt, nitrates and other chemicals and expect your body to be healthy. Garbage in, garbage out. 4. Stress - (job, money, spouse, relatives, grief) Is your body in a constant state of stress with no release? Some stress is good for you. It provides motivation to get things done but it should not be in an all-consuming, continuous state of stress. Your body and mind must have a healthy release such as: quality entertainment, hobbies, social interaction, laughter, exercise, etc. Stress, like trauma, can lead to hormonal imbalances. 5. Lifestyle Habits - (smoking, drinking, drugs) If you think you can keep smoking cigarettes and be healthy, you are fooling yourself. There is overwhelming evidence to the carcinogenic chemicals in cigarette smoke. If you want to be healthy, quit smoking. It doesn't matter how many doctors you see or how many medications you try, your health (and skin) problems will only increase if you smoke. Stop now! The same is true of excessive drinking of alcohol and use of drugs. It just makes sense, doesn't it? 6. Trauma – Abrupt, traumatic experiences can have a profound effect on your health. Sudden accident, injury, emotional trauma, the death of a loved one, divorce, can all produce stresses on the body that can cause hormonal imbalances. These hormonal imbalances can negatively affect all other systems of the body, including the immune system. 7. Allergies - An Allergy is a hypersensitivity disorder of the immune system. Allergic reactions occur when a person's immune system reacts to normally harmless substances in the environment. A substance that causes a reaction is called an allergen. These reactions are acquired, predictable, and rapid. Mild allergies like hay fever are very common in the human population and cause symptoms such as red eyes, itchiness, and runny nose, eczema, hives, hay fever, or an asthma attack. Allergies can play a major role in conditions such as asthma. In some people, severe allergies to environmental or dietary allergens or to medication may result in life-threatening reactions. 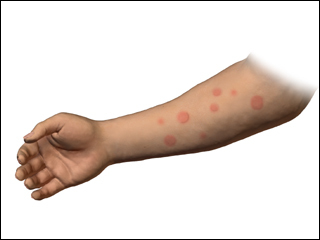 Food allergies, and reactions to the venom of stinging insects such as wasps and bees are often associated with these severe reactions.